To say I was excited to visit The Workrooms’s new Queen Street West location would be an understatement. It was my sewing debut and like many hard working folks, I was keen to explore a new hobby where I might offload the day’s drama to produce something new. Over the past few years there has been an insurgence of DIY shops all over Toronto, from woodworking, jewelry, upholstery, painting, knitting to shoe making and everything in between. For a small fee most shops offer memberships, workshops or by the hour rates where everyone from professionals to hobbyists can work, share and collaborate in a nonthreatening highly creative and motivating space. The DIY workroom concept is especially inviting for those yearning to try something new without the space to do so in Toronto’s condo jungle, less enthused by the prospect of the expense of buying needed tools upfront. For me, my stress relief began a few months back when I first tried my hand at knitting and crocheting: scarves, hats, blankets, shawls, oh my! I quickly became obsessed. With my hands busy and mind humming the worries of the day seemed to slip away as project after project completed. Teaching myself with the help of a few close friends was a great place to start but I wanted more. My sights were now fixed on sewing. 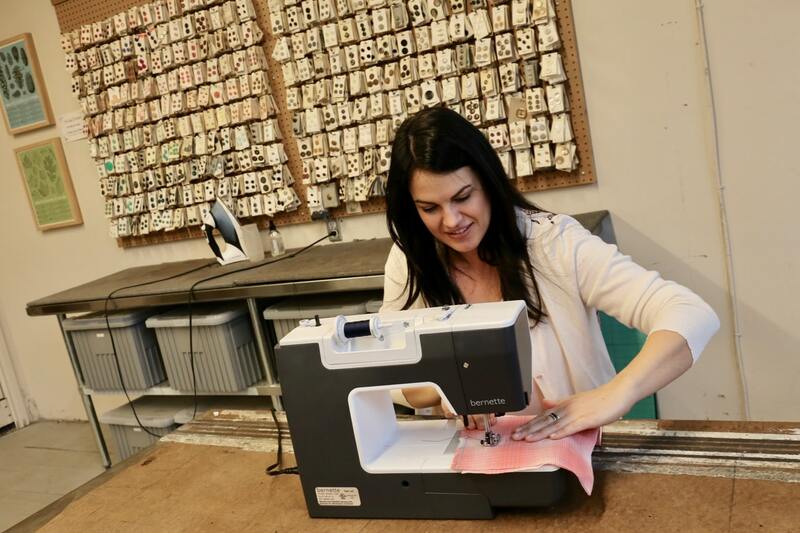 How great would it be to be able to hem my own pants, fix holes in a jacket, or make my own bag – I wanted to know the sewing machine intimately. I was of course intimidated but lucky for me I got my hands on DK Publishing’s updated new edition of Alison Smith’s bestseller The Sewing Book, an encyclopedia-style one-stop-shop perfect for curious creative’s keen to master the sewing machine. Featuring over 300 step-by-step techniques, it’s quite simply the only sewing book you’ll ever need. Every tool and technique required to make your own home furnishings or clothing is closely photographed, step-by-step, with detailed and clear annotations. The Tools section begins by unpacking the newbie sewers basic toolkit, while also including information on patterns – how to measure, how to use, and how to adjust them. Eye-popping gallery spreads appear throughout the substantial Techniques section and showcase darts, zips, pleats and beyond, as well as key sewing stitches. Plus, you can impress your guests by applying your acquired and refined skills as you make some of the 25 home décor projects at the back of the book. 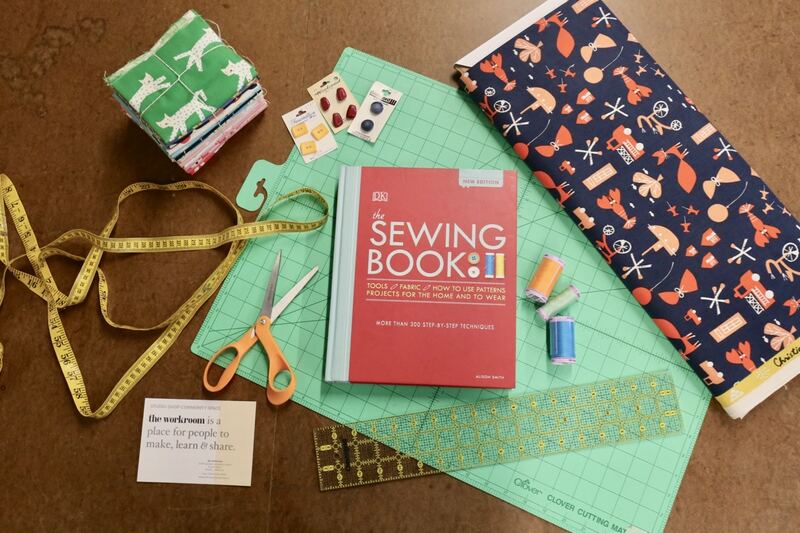 With book in hand, I skipped into The Workroom determined to put the The Sewing Book and myself to the test. 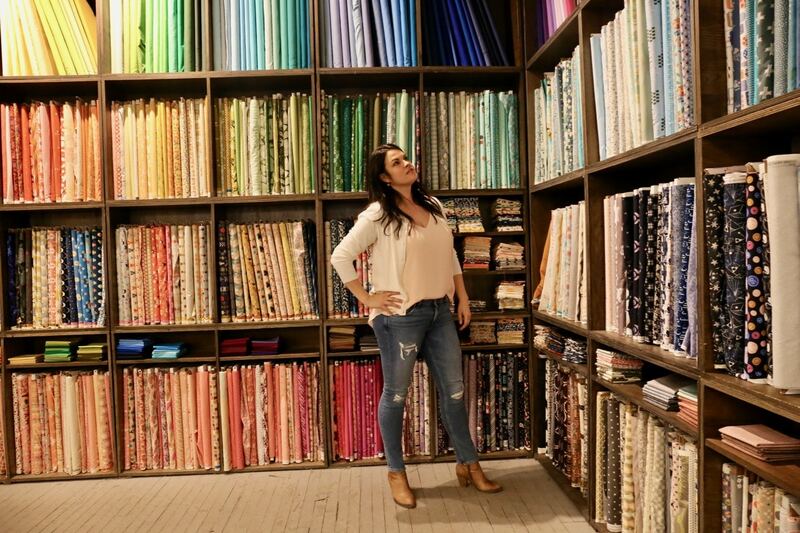 I was greeted by owner Karyn Valino, who gave me a quick tour of her colourful space before enthusiastically flipping through The Sewing Book’s pages. She gushed over its gorgeous photographs and easy-to-understand patterns, “It’s really very comprehensive. Unlike most sewing books it’s the photographs that make this book really great” she admitted. Not only for beginners, she felt it was a superb reference even for someone who teaches sewing as it’s such a comprehensive tome – The Joy of Cooking for the stitch-it crowd! 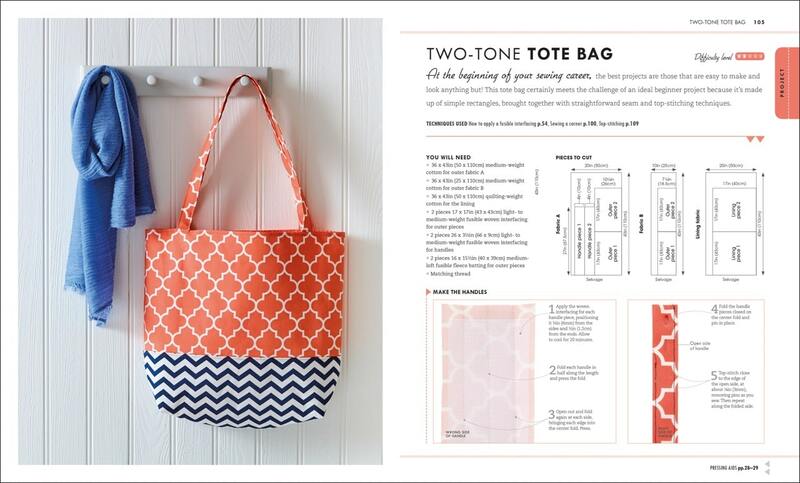 Now that I’m able to use the sewing machines at The Workroom I’ve already got a second project from The Sewing Book on my to do list: I’ll be visiting again with a friend to attempt making my very own tote bag! If it’s anything like the first project, I’ll flip and finish my way through all ten projects the book offers in no time. Who knows, maybe this stress reliever turns into a second career? Either way, with this new edition on my shelf I won’t be putting a pin in my newfound hobby anytime soon. If anything, my tape measure and I hope to remain on the cutting edge, threading buttons and patching up old holes with my two thimbles way up!